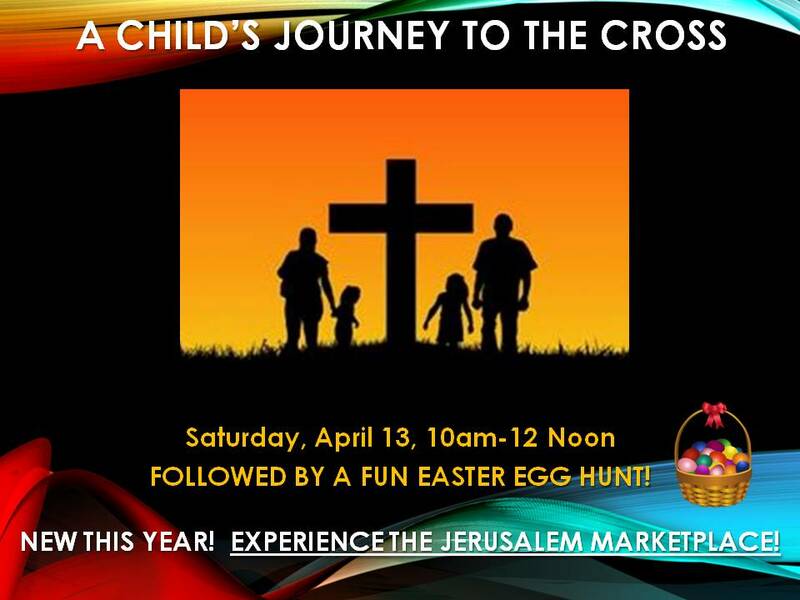 Bring your family for "A Child's Journey to the Cross" at Colonial Heights Christian Church! This is a free event for the community! As you enter the doors of the church building, you will be led to the Jerusalem Market Place where you and your family will have an interactive experience with the many different vendors such as - the Carpentry Shop, the Jewelry Shop, the Basket Shop, the Pottery Shop, The Bakery, the Spices & Olive Oil Shop, the Music Shop, and everyone's favorite the Livestock Pen! Your family will then be assigned a guide as you follow Jesus through the gates of Jerusalem. At the next location, you will see Jesus as He has His last supper with His best friends, His disciples. You will then be led to the Garden of Gethsemane where Jesus was betrayed. The last stop of your tour will climax as you experience the first Easter morning! Hold on, we're not done yet! As you enter into the Gym, your family will be able to eat some snacks, participate in some crafts, and enjoy having fun in the Bounce House! The morning ends as the kids enjoy an Easter Egg Hunt with over 4,000 eggs! Please mark April 13 on your calendar and come join us!